I’m just going to cut to the chase. You need these pulled pork carnitas in your life. Especially if your life involves feeding lots of people at an outdoor barbecue and especially if you want to give them an out of body experience. Allow me to explain. With this recipe, the pork cooks low and slow in a crockpot for about eight hours, giving it plenty of time to absorb the tasty blend of spices, chipotle peppers and beer it simmers in and plenty of time for you to sit back and watch it do all the work. And when you’re hungry guests arrive early, late or somewhere in between, you’ll just hand them a pair of tongs instead of frantically flipping burgers to everyone’s preferred temperature. And it gets even better. These pulled pork carnitas are topped with a heaping spoonful of fresh. peach. salsa. So you have this whole warm and spicy meets refreshing and sweet thing going on. Then just sprinkle a bit of cilantro on top and you’ll easily have the tastiest BBQ on the block and you won’t have even tried that hard. If you want to make a complete meal out of it, just serve alongside a simple salad and grilled street corn. Bathed in chipotle butter and topped with cotija cheese and a drizzle of lime juice, it takes grilled corn to a whole new level and really compliments the flavors of the carnitas. All that’s missing now is a cooler full of Pacifico, some lime wedges and you’ve got it made in the shade. This menu is perfect for Memorial Day, Father’s Day and all the other outdoor barbecues you plan on hosting this summer. As always, I hope you enjoy! *2.5 lbs is plenty for 4-6 people to have 2-3 tacos each and maybe more. If serving a large crowd of around 10 or more people, opt for 6 - 8 lbs. Place the salt, cumin, pepper, oregano, cinnamon and cayenne in a bowl, stir and set aside. Next, trim any excess fat from the pork. Place the pork in a slow-cooker and sprinkle or rub the entire bowl of seasoning on the pork. Then, add in the garlic, chipotle peppers, diced tomatoes and beer or orange juice. Cover and set to cook on low for 8 hours. When ready, use tongs or a slotted spoon to remove the meat from the slow-cooker and place in a baking dish or pan. Use two forks to shred the meat. Then, use a small measuring cup to pour some of the leftover juices over the meat to keep moist (use as much or as little as you want!). Store some of the liquid in a jar for reheating or toss. To serve, fill a corn tortilla with the pulled pork and top with peach salsa, chopped cilantro and any other garnishes you like! Combine the chopped peaches, cilantro, red onion, salt and lime juice together in a small bowl, stir to combine and serve or refrigerate until ready to serve. Prepare the corn by pulling back the husk to the base, removing the silks, and then pulling the husk back over the corn. Once you’ve prepared the corn, fill a large bowl with ice water and let the corn soak for about 10 minutes (this will keep the husks from catching fire while grilling and keep the corn nice and juicy). Meanwhile, heat up the grill (medium heat). 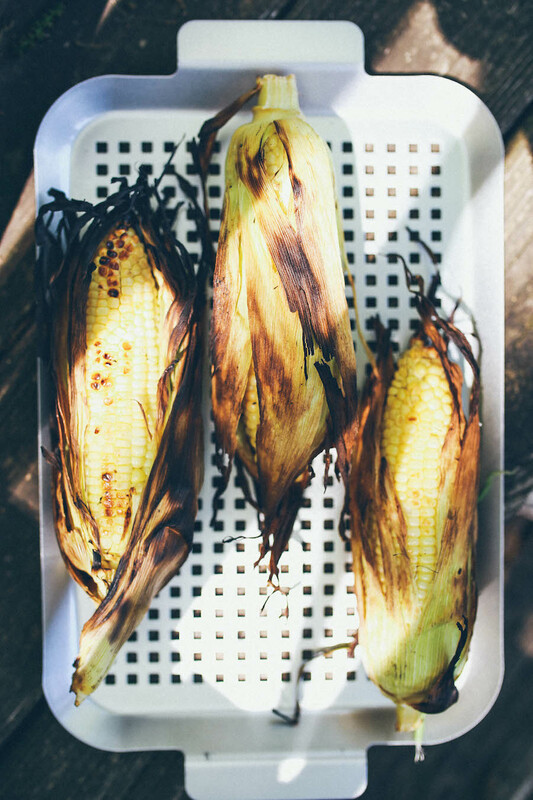 Then, place each ear of corn directly on the grill and cook for about 15-20 minutes, turning occasionally, until the husk is charred and the kernels are golden and softened. Meanwhile, melt the butter over medium low heat in a small saucepan. Once melted, stir in the chili powder, lime juice and salt. Once the corn is cooked and the kernels are soft, remove from the grill and place on a baking sheet lined with foil or parchment paper. Next, either remove or tie back the husks. 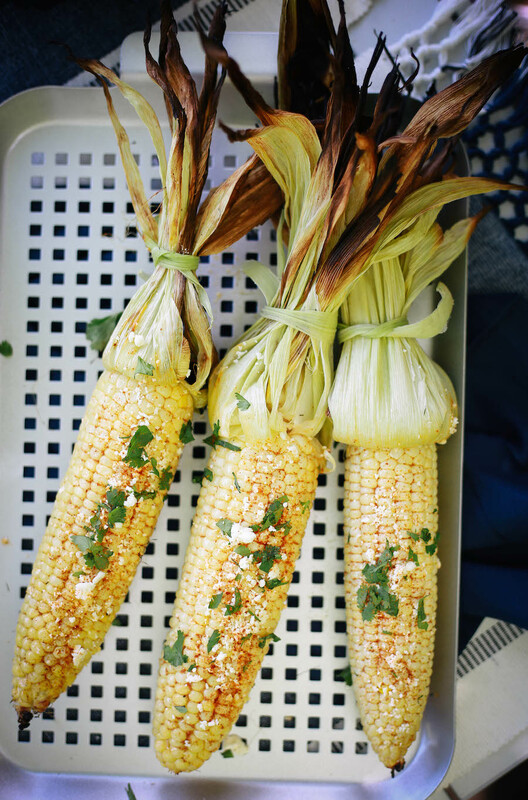 Then, brush or baste the corn with the chili butter, sprinkle with cotija cheese, cilantro and enjoy!